On a hot Wednesday afternoon in Naurenpuu Village of Turkana County, Ms Apuu Nakuruka sits down leaning on her mud-walled and grass thatched manyatta, taking cover from the scorching sun. In her arms is her baby, deep in sleep. The child's head is slumped over, chin touching the chest, quite an unusual posture for a baby that should be enjoying the warmth and love of her mother's breast. Ms Nakuruka rises up to greet her visitors -- nutrition experts from Save The Children and healthcare workers from a nearby health facility -- who are on their routine visits across households. Interestingly, the seven-month-old girl is oblivious of the commotion created by the exchange of pleasantries between her mother and the visitors and only opens her eyes, albeit reluctantly, when the party is about to settle down on a mat spread under a tree next to her house. The glazed look on her whitish eyes is enough to send Nurse Lucy Lomechu -- one of the visiting health workers -- worrying, and she candidly explains that a child should be alert by nature and not that lethargic. "This is a clear cut indication that the girl is lacking certain crucial nutrients. I would bet my last coin that she lacks irons," explains Ms Lomechu, whom a stranger would be hard pressed to believe that she was born, bred and educated in the semi-arid Turkana County. For the baby, the presence of so many children and visitors dangling and clicking cameras does little to cheer her up. It's a sad state of affairs, and both mother and daughter look sad and disillusioned. Ms Nakuruka informs us that the baby, the last of her eight children, hasn't played all day and that has been the case the past few days. True to her word, the baby sleeps for most of the time we speak to her mother. When she wakes up and her mother makes attempt to breastfeed her, she doesn't even look at what should be her primary source of food at that age. She just props herself on the breast as she sluggishly looks away from the mother, as if to say she is not interested, or because she knows nothing will flow from her mother's breasts. For medics, a child who is not eating sends a signal that there is a problem somewhere, but one who refuses to breastfeed sends even a clearer message: something is extremely wrong with this baby. In Naoyatira Village, a few kilometres away from Naurenpuu Village, another seven-month-old baby girl belonging to Ms Lydia Ekeno is being attended to by Beatrice Lokwawi, a trained community health volunteer (CHV). At a glance, the baby seems fine, but upon closer examination, the CHV points out to her thin-brownish hair, a sign of severe malnutrition. Nurse Lomechu takes note of her swollen arms, from the wrist upwards, another indication of malnutrition. Additionally, when Ms Lokwawi exposes the baby's back for a routine check-up, Mr Vincent Opinya, Save The Children's staffer, notices the prominent ribs and visible shoulder blades. "When you look at the height of the child, check its weight and compare that with age, they don't add up" Nurse Lomechu says. This is just but a drop in the ocean for there are tens of hundreds of other cases of malnutrition, which is a prevalent problem in the 77,000 square kilometres vast Turkana County. Ms Nakuruka's baby is one of the 54,264 children under the age of five years, suffering from acute malnutrition in Turkana county, according to statistics by the Kenya Food and Nutrition Situation Seasonal Assessment Report (March, 2019). The report further classifies 14,420 of them as being severely malnourished, and in need of urgent treatment to avoid further deterioration of their situation. The report also indicates that the nutrition situation in Turkana County remains at critical level, with a Global Acute Malnutrition (GAM) level among infants and young children falling in the range of 15.0 -- 29.9 per cent. Simply put, according to WHO, severity of malnutrition is only acceptable if the prevalence is less than 5 per cent while a GAM value of more than 10 per cent indicates an emergency. Turkana's has been teetering between 15 and 30 per cent. Ms Regina Mbochi, a nutritionist who has monitored children's dietary needs in the northern counties for 10 years now says she has been here and seen it all. "The malnutrition rates have remained stubbornly high over the years, which highlights no obvious recovery from the persistent shocks from drought, floods, and conflict, among other drivers of malnutrition, facing the community in this county," she says. A 2018 survey by the county government further revealed that one in every six children (18.1 per cent) in Turkana County is wasted, meaning, an estimated 39,093 children here are too thin for their age. Concurrently, one in five children in Turkana is stunted (17.8 per cent) -- or an estimated 38,445 children. Stunting means too short for age and together with wasting, these are the two most common forms of malnutrition in Turkana. In Turkana, and indeed in many other arid and Semi-arid lands (Asals), even though the problem is big going by the statistics, it doesn't seem to capture the attention it deserves. In most cases, hunger always steals the show. But cases of hunger as highlighted in the media, it would appear, are just but a tip of an iceberg -- a very big iceberg. Malnutrition, experts argue, is an even worse problem. No one knows this better than Dr Lynn Kanyuuru, the head of health and nutrition at Save The Children. "Hunger is when you miss a meal. Like today I have not taken breakfast, so I'm hungry but I'm not malnourished. Malnutrition is a medical condition where you have depleted your stores. Hunger is just a state of lacking food." "Malnutrition is more severe when compared to hunger," Dr Kanyuuru adds. "By the time hunger becomes a medical condition, your body is suffering the effects of hunger so you waste away, become underweight and you don't have the energy reserves to run your bodily functions. That is life-threatening." Currently, approximately 800,000 Kenyans in 23 counties need food aid because of the poor performance of 2018 short rains, according to the National Drought Management Authority. In Turkana though, even when food aid is availed during a crisis, experts on the ground concur that the malnutrition levels never really go down to acceptable levels. It is an almost continuous cycle that never ends. "When they are facing extreme hunger and starvation, and food is given in the interim, even when they get out of that period and recover, they never quite return to normalcy," says Dr Kanyuuru. In a case of malnutrition, Ms Mbochi says, you will be looking at somebody who does not have enough food and thus lacks enough nutrients. Therefore, she says, this results in wasting, a condition that manifests in a child being too thin for their height, and stunting where the child is too short for their age. To stay well nourished, human bodies require a balanced diet that takes into account carbohydrates, proteins, vitamins and minerals. The idea is to have food from different food groups. But nine in 10 Turkana residents cannot afford this kind of luxury, thanks to poverty, which stands at 94 per cent according to Kenya National Bureau of Statistics. In the homesteads the team visited, it was clear that most cannot afford three meals a day, let alone a balanced diet. For example, when we met Ms Nakuruka at her homestead, it was half past three and she looked distressed. The day was wearing out, yet she had nothing to feed her eight children that evening. She said that the family last had a meal 48 hours ago. She does not have a kitchen garden and water is a luxury that she has to walk several miles to fetch. Only two goats are left to show for her pastoral livelihood. Asked what she thinks the government should do to alleviate her situation, she gives a blank stare then, "I don't know." For mothers who have children ailing from malnutrition, the situation gets so bad that sometimes they have to share the food supplements meant to treat their malnourished children with those who are healthy. This, says Mr Dave Kihianyu, Save The Children programme manager for the Turkana project that has been detecting and treating malnutrition, delays healing for malnourished babies and in a big way makes malnutrition take a huge toll on the poor. "Yes we will counsel and advise that while this is food, it is actually treatment and usually you don't share treatment. This caution is hardly adhered to here in Turkana, and understandably so, because in such a situation, what do you do if you are the mother in that household?" he wonders. Interestingly, when there is food in the homestead, however little, women feed their husbands -- the breadwinners, first. This is in compliance with culture. There is also the notion that certain foods such as sukuma wiki belong to animals and that stands in the way of meeting the children's dietary needs. In Turkana, as is the case with many other northern Kenya counties, experts say, malnutrition is a social, cultural and economic issue. "It is a culmination of so many things that failed to happen in the first place. If you don't solve the food security issue, poverty and literacy problem then you are not dealing with the root cause of the problem," offers Mr Kihianyu. Ms Mbochi, the nutritionist, says that the effects of malnutrition can be far- and wide-reaching. Children who suffer malnutrition have their cognitive abilities affected as is their school performance. "People don't even realise that children who suffer malnutrition suffer these effects. Malnutrition results to mental and physical stagnation. These are some of the effects that every community leader needs to be aware of, if they want their communities to be made of intelligent people," she adds. Ms Mbochi explains the relationship between malnutrition and diseases, which she terms as a vicious one. "Malnutrition takes away the body's capacity to fight off infections. This means if you are malnourished, you are more vulnerable to illnesses. You are sick you are more likely to become malnourished," says Ms Mbochi. Malnutrition kills, she adds. 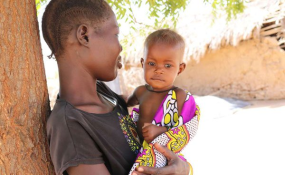 "If children with acute malnutrition are not identified and treated in good time, their condition may deteriorate to marasmus or kwashiorkor, whose management is more complex, and which puts children at increased risk of death," offers Ms Mbochi. Still, by weakening the body's immune system, malnutrition opens the floodgates for other diseases such as diarrhoea, pneumonia and malaria that are likely to send a child to an early grave. The case of Ms Atabo Eyanae, a resident of Turkana perhaps provides the clearest picture of what can happen when a mother is malnourished. When she was pregnant, she had nothing but a cup of black tea to sustain herself towards the end of her pregnancy. So in 2016 when she gave birth to twins, alone at home, they were both sickly and their bodies wracked with diarrhoea. Baby Ekuru and Maximilla were born safely on a Tuesday, but four days later, on Saturday, Ekuru died. This was as a result of malnutrition, which meant that if baby Maximilla was not put on treatment immediately, her survival chances were slim. She had already developed pneumonia. "I was so worried that day," Ms Eyanae says. The nearest health facility referred her to a hospital in Lodwar, the only one that could provide the care her baby needed, but it was 150 kilometres away from her homestead. Luckily for Eyanae, she says, an ambulance run by Save The Children in her region facilitated the travel. Fast forward to today and baby Maximilla is a strong, chubby two-year-old girl. Sadly, Ms Eyanae's ordeal mirrors that of many mothers in Turkana who have lost their babies to malnutrition or related causes.